This concludes my Series on Your Journey to Being Whole. 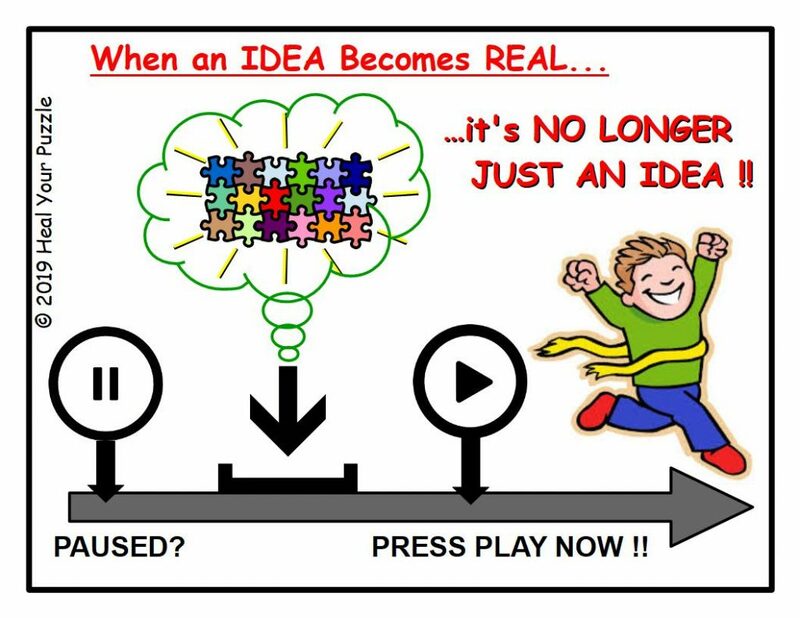 It started with Realisation (June 2018) explaining that when an idea suddenly forms, there is a feeling of clarity and understanding about something… the puzzle has come together in your mind and a picture has formed… which then becomes another puzzle piece in a larger understanding… triggering a new Intention for personal growth. 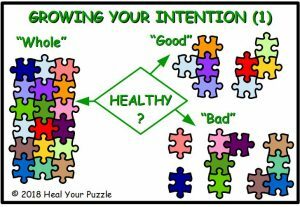 I shared with you how Intention shapes your Journey and that Non-Judgement and Non-Interference are powerful catalysts to keeping you growing. Non-Judgement understands that we are all on a Journey and we all have vulnerabilities and key life lessons; Non-Interference allows each of us to follow our Life Paths as clearly as possible and in a way that teaches us our own lessons but also interacts with others to be part of theirs. As we become more Empowered Individuals, we then become more aware of our Relationships, not just with others but also with ourselves and whether our life on all levels nurtures or drains us. At this stage, understanding about having Empowering Relationship Energy becomes key, taking self-responsibility that your actions empower others and learning to transform others disempowering behaviour into something positive for both of you. Every step you take in your self-understanding re-empowers the parts of you that have been distorted by your past, this life and inheritances, and eventually it will be stored in your Being as Experience rather than with any attachment or reliving it in the Now. This to me is the Healing Journey and Lessons repeat on different levels until you have covered every ‘Module in the Course’ ! Once you have healed enough in your Outer Relationships, a deeper Inner Journey begins because you are ready to discover what really matters to you, not just what others think is important or what your genetics dictates. You will start to experience your deeper connection with everything… bringing real feelings, real emotions and can be quite a personal rollercoaster but is the beginnings of being truly authentic and really Real in your Life. An Attuning process follows where all aspects of your Life relate more honestly with each other and underlying issues may come to the surface to be resolved rather than being tolerated or kept hidden. Last time, I wrote about the Inner Work and how this coincides with the feeling that you wish to connect more deeply or authentically with the World, you wish to grow as a person and want a meaningful Life with real meaningful Relationships… this is You wanting to be You in your Life. 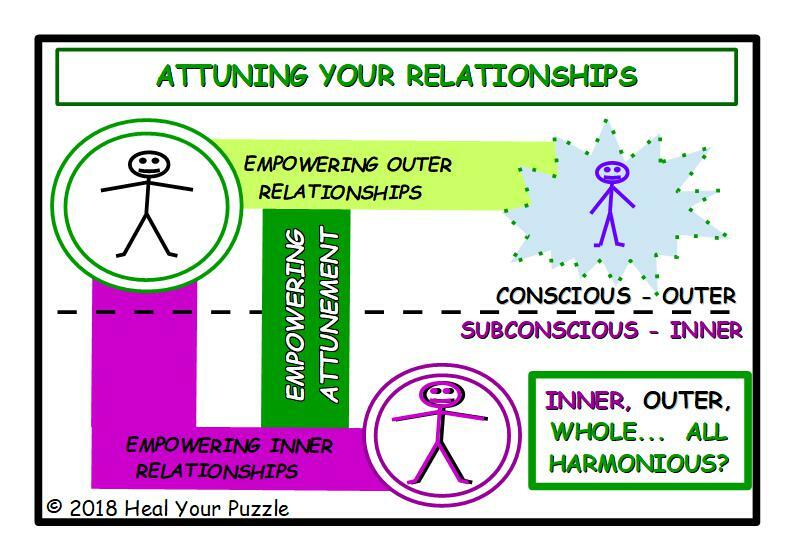 I asked “Do Inner and Outer Agree?” and this relates to Attuning Your Inner and Outer Relationships. Life may have seemed ok but some relationships may have turned out to be unreliable, superficial, and/or unsupportive when life challenged you; some also may seem to have run their course and one day you realise they are no longer there or may start to conflict with other parts of your life… When Life gets Real, who will stand by you? Who will always be there? Who will actively support you? Who will grow with you? Who will judge you, ignore you, walk away…? Who is causing conflict in other areas of your life?… How do you decide what to do with all this? Empowering your Life The more harmonious your Life, the more enjoyable and health-giving it will be. Harmony comes from attuning all aspects of your Life, your Inner World, Outer World and both together; in energy terms, empowering relationships form between existing relationships. With this comes a feeling of intimacy, of being part of something bigger than just you, a deeper and more expansive feeling of connection and truth. Why live a life that is not yours? This is the seventh in this Series where I am sharing some of the key realisations I have had on my own Journey to feeling more complete. The first steps to becoming Whole, to having a life which you love,which nurtures and fulfills you, are those that empower your personal space, help you feel safer and more able to make decisions that are right for you. This learning grows with you as you continue on your Journey into Relationship Dynamics when life is not just about you and your security but is about you being involved in the World. Difficulties here may have been the reason you became vulnerable in the first place or you may just have got to a point in your life where you feel empty or disappointed and cannot work out what to do next. 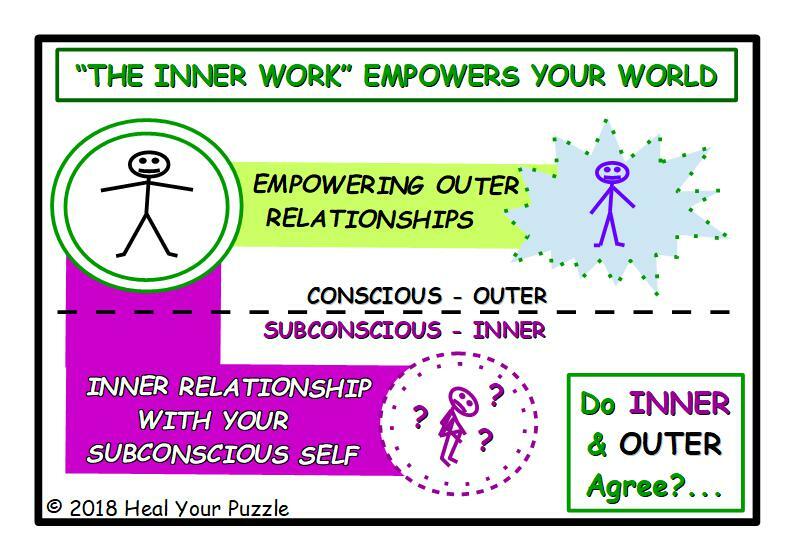 The Inner Work begins…When you want to connect more deeply with the world, when you want your relationships to feel more real, when you want to put more of yourself into your life and nothing in your outer life seems to help, work begins on your Inner Map, the map of your Inner Self and how your Conscious Self relates to that. This becomes part of your Whole Journey. GOOD VS BAD – Moving Beyond Judgement ‘Highest Good’ is a well-known philosophy for spiritual growth; surely we all want a life which is good… but who decides what is good? If I think something is good and you think it is bad, who is right? And if I stop doing something that I really enjoy because others think it is bad, how do I deal with that inside? Guilt? Shame? Blame? Suppression? Is there something you do that you think is good and it hurts someone else, is that still good? Do you consider yourself Bad but think that’s a good way to be or vice versa? Labelling something Good or Bad is an opinion, a judgement, based on an individual’s or a society’s belief systems. Healing-wise I worked with Highest Good for about a decade, but then I began to see ‘Bad Energy’ building up like a blockage in a pipe… any more and it would explode. The Highest Good Intent was somehow stopping me face the ‘Bad Energy’… it felt unresolved… I realised that I needed to include this ‘bad’ in my healing protocols and began using the Highest Way Intent. In just realising this idea, I saw how it freed up my Energy, my Life and I felt more complete. Last month I talked about being Centred and that this is key to life becoming more enjoyable and easier; inspiring synchronicities occur without any apparent effort on your part… you begin to become more in tune with your surroundings and, rather than being overwhelmed with stress and chasing or running from certain situations or life in general, you begin to respond rather than react… stress drops away… that elusive Christmas present jumps out at you! This feeling of Flowing with Life is called ‘Being at One’. 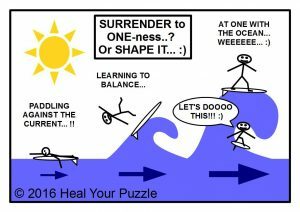 SURRENDER to the Flow or SHAPE it? In the Past, there was a common accepted culturally-led life path: how relationships played out, when we got married, how many children, getting a job or career for life, how you worship, what was expected and acceptable behaviour… we had surrendered into the norm, the ONE-ness of our Societies. What has happened in recent times is that there is a realisation that we can actually SHAPE our lives; we can walk our own path… just being part of the flow is not enough… We are still learning how we do that and still have a coherent society, a coherent harmonious World. The weight of water in our inherited waves is huge and becoming not only ONE with the Ocean but actually working with it harmoniously and joyously seems a mammoth task… but it is possible! Holistic Self-Development supports and guides this Journey – your Whole Being is part of the process… We can all not only learn to ride the wave but also eventually Carve our own Way through the Tube! !